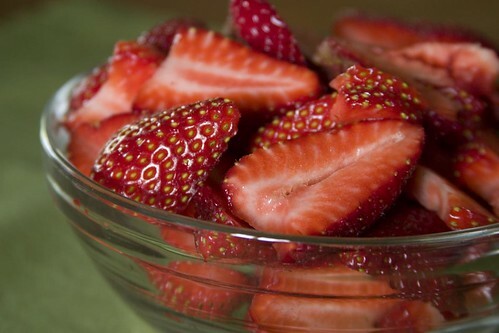 Strawberry season is upon us! And a week early, at that. My CSA's "Extra Fruit" subscribers received word early this week that our extra fruit option, which normally starts in May, would be beginning this week instead. So, rather than getting two baskets of strawberries today, I got six! And they're beautiful, but there are a lot of them. I'm not quite prepared for jam-making and canning yet this season, so my usual go-to use for large quantities of summer fruit is out for now. Fortunately I have a father whose birthday is tomorrow, and whose traditional birthday dessert is his (delicious) cheesecake with fresh strawberries. And as it happens, his birthday wish is for the whole family (minus Sister #2, who's away at school on the east coast), plus any available significant others, to get together for dinner tomorrow evening. Six or seven people require quite a few strawberries for their cheesecake, so that's three baskets with a good home, but what about the rest? Not just cake, though: miniature cakes encrusted in sugar. And while you could keep them right-side-up and top them with icing (as if they needed more sugar), I turned mine sparkle-side-up and served them with fresh strawberries. This recipe started out as a cake--a bundt cake, to be precise--but I decided to make it into mini cakes. The Suitor always groans in earnest-but-faint protest whenever he sees that I've been baking something tasty. It's not that he doesn't like the tasty baked goods, he just thinks they're evil. Or I'm evil. Or something. Something about keeping a waistline in check. Anyway, I have this strange notion that somehow lots of small cakes will be less obvious than a big old bundt cake sitting on the counter, and that he'll be less likely to object. It never works, but the notion persists, and so a cake became cupcakes. Or rather, mini cakes, since they're upside down from regular cupcake orientation. Recipe and a few notes below! The quantities listed below will give you more than enough batter for a dozen cupcakes, maybe enough for 18. I didn't want to fiddle further with the recipe, as I wasn't sure how well a two thirds multiplier would work out, so you'll have some extra batter. (Yum!) It's up to you whether you eat the extra batter as it is or bake it up in another tin. Just don't try to get rid of it by filling the muffin cups more than 3/4 of the way to the top, or the cakes will overflow and you'll have a devil of a time getting them out of the tin. Place oven rack in middle position and preheat oven to 350F/175C. 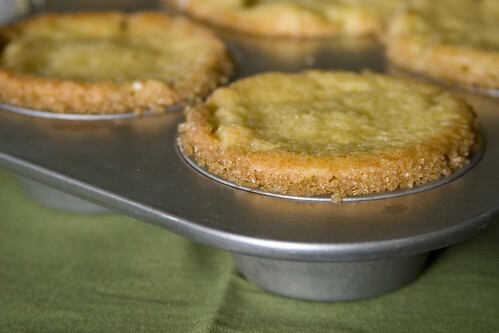 Brush or smear butter liberally on the inside of a muffin tin. Do not be shy here: you want a good amount of butter in each muffin cup so that the sugar will stick to it nicely. When you've finished greasing the tin, sprinkle raw sugar into each cup and tilt the pan, tapping as needed, so that sugar coats the bottom and sides of each muffin cup. In a medium bowl, whisk together flour, ground ginger, baking powder, and salt. Set aside. In a large bowl, beat 1/2 cup butter until smooth. Add the 1 cup sugar and beat until well blended. Add eggs and egg yolk one at a time, beating well after each addition and scraping down the sides of the bowl as needed. Beat in vanilla. Add flour mixture and yogurt alternately, beginning and ending with the flour, mixing on low speed and only until just blended. Fold in the crystallized ginger. 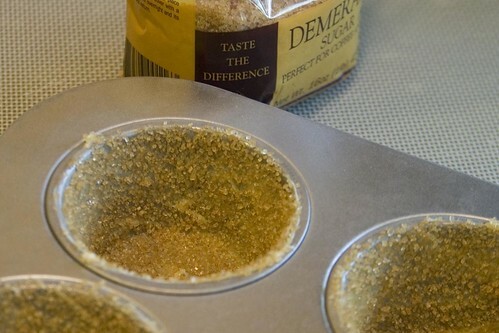 Spoon batter into prepared muffin tin so that each cup is 1/2 to 2/3 full. Be careful not to disturb the raw sugar. Bake until cakes are puffed and light golden on top, and a cake tester inserted near the center comes out clean, about 25 minutes. Transfer to cooling rack and cool cakes in pan 15 minutes. Remove cakes from pan and cool completely, inverted on rack so that sugared sides are up. Garnish as desired and serve. Raw sugar is also known as demerara or turbinado sugar. You ARE in the baking mode at the moment. 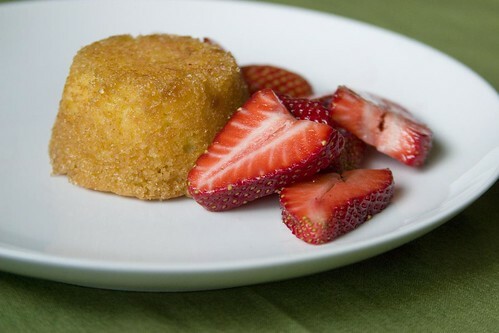 I made your drop biscuits (for strawberry shortcake) this weekend, but I need to tinker a bit with the recipe. My batter was too thick and too salty . . . although it still made a nice biscuit. Hmm, I've never had a problem with the biscuits being too salty. I tried Homesick Texan's recipe the other day, by the way, and they were delicious! I'll keep that one around. These cakes weren't for Dad, they were just so that I'd have a fun way to use up some strawberries. His birthday cake was his cheesecake, which was much enjoyed by all.